Those of you in the US will be well aware of what has become known as the ‘anti online gambling law’. But you might not be aware of the work to challenge it. Well, we now have a court date! For those that haven’t heard of the anti online gambling law, you’ll be stunned to find your American cousins are not allowed to play in online lottery syndicates, in any country, not even the US. Why? Because this piece of crazy all crushing law was snuck through, hidden beneath the SAFE Port Act – an entirely unrelated piece of legislation to improve security of US ports! It’s interesting to note that the “Internet Gambling Prohibition and Enforcement Act” was previously rejected when it wasn’t hidden under the carpet. (You can find the bill here at the Library of Congress). Thankfully Lee Rousso, an attorney in Renton, WA has been successful in securing a hearing date to challenge the law. Yes, he’s taking Washing State to court, in what will be the first challenge to this crazy piece of unwanted law. The hearing will be 21 September 2007. So mark your diaries cousin America, it could all change. (You can follow Rousso’s progress here). 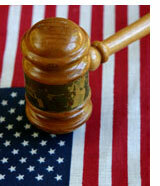 What do you think of the US ‘anti online gambling law’? How have you been affected personally? Add you comments below. So much for “the land of the FREE”!! The courts of America have dragged their heels and bounced this back and forth. The whole online gambling law is one hot potato the courts have been happy to bounce to another court. But Lee has refused to crumble – and now has a significant hearing date of April 25, 11am at Kent courthouse. Be there in support if you can. Things are progressing in the right direction, but Rousso reports the hearing date has now been moved back to May 15. He sounds confident the date will not move further though. Wish him luck. That is why I have been playing less often for less lines until they follow the foot steps of the UK. Online play is the future, they can’t prevent it. Money is a very powerful energy man, everybody in the world needs it. I have to agree with you that playing less often for more lines is a smart choice if you want to hit a jackpot, and not see a store clerk face everyday. You will miss some big jackpots because you do not enter every draw, but the goal is to win. Jackpot. Thanks for posting the link to the US Bill [HR 4954] which became Public Law No: 109-347 on October 13, 2006. I have searched for details as to WHY online lottery syndicates located physically outside the US were off-limits to us Yanks, whilst apparently those here (such as WinTrillions) are not. I’m still not clear on the answer to that question. For now Off-shore internet gambling=money laundering! Also, your link to “Rousso’s progress” is dead. I remember his name from the online Poker fight. He lost in the Washington state supreme court 5 years ago. I doubt he’s done much with online lottery syndicates though. I think people should be able to do what they want. But unfortunately some people can easily get addicted to the type of games and end up losing more than they can afford to lose. I only play virtual games, so I don’t end up spending all my money. It’s true that the odds are always against you. When I have played real slots or Black Jack, I honestly have never won anything period. So, if you value your hard earned money, try to play less often or not at all. Good luck!